Effective 9/1. If you have any questions or concerns, please call or email. Look no further! My (somewhat nervous) kids started here at ages 5 and 7...they look forward to each and every class and watching them during class, they are so happy, engaged and focused. In addition to martial arts skills, they are having a blast while learning focus, respect (for themselves as well as others! ), a work ethic, self-esteem, determination...the list could be endless! The staff and the instructors are so kind and sincere. 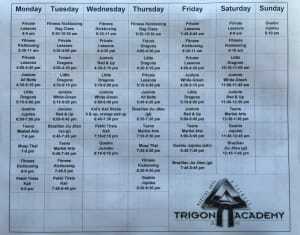 I am thrilled that my children are training at Trigon. 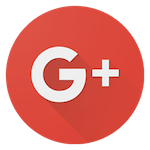 I don't write many reviews, but this is a business that deserves it. My 3 kids trained at Trigon for many years. Their training not only taught them self defense and confidence but going through the step by step belt process with short and long term goals taught them to work hard each day one little step at a time to accomplish any goal in your life (other sports, college goals etc). The amazing teachers at Trigon have been truly wonderful role models in my 3 kids lives. I also kickboxing there and absolutely love the workout both mentally and physically!! My two boys love going here and are always eager to share with their friends all that they know and have been learning! They not only learn discipline and patience but are becoming stronger and having fun too! I also feel like the staff here are very friendly and skilled, are extremely patient with the kids and seem to just love what they do! It naturally mirrors what they teach. I highly recommend.